Hi guys I'm Alisha, Operations Director here at FCF. Jordan is currently on vacation without wifi so she asked me to share this with you. 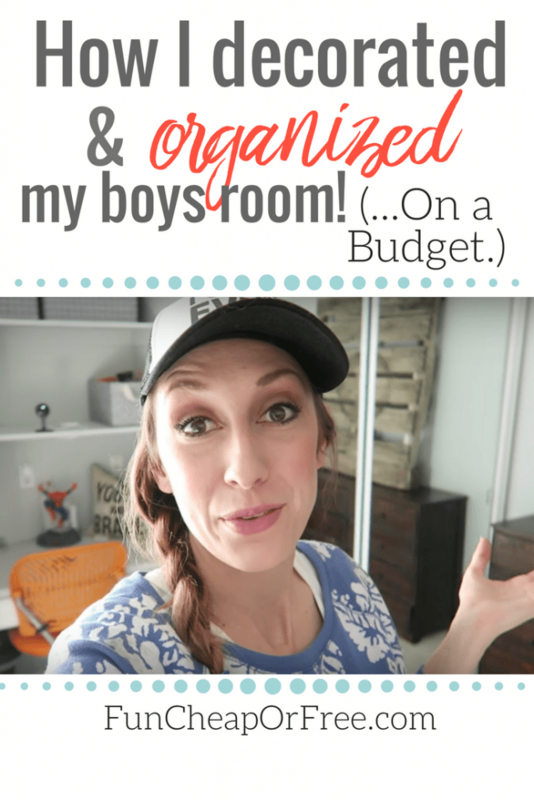 She recently filmed a tour of her Boys' room and shared it on the Millennial Moms Youtube channel. I don't have kids myself but LOVE to see any room tour to get ideas for myself. I find that no matter what the room is intended for there are always things I never thought of. Like the light in the closet (spoiler :)) I can definitely put that to use! I love how, even simple, it still is a great boys room where they can have their own space. These bunk beds look great! I like that there are stairs instead of a ladder. Also anyway to get extra storage is a bonus with those drawers on the side. As mentioned in the video making bunk beds are a pain but a great solution is Beddy's bedding. They are a bit of investment but worth it in quality and ease of use. You can get 20% off your purchase! Use the code Take20 at Beddy's. Plus you can get free shipping for orders over $50. Most of the decor is from either Home Goods or Yard Sales. Jordan mentioned that the magnet boards are from Ikea but you can also make your own bulletin style boards like these HERE. I love the light in the closet! It is a great solution for those areas that you want a little light but don't want to add any permanent lighting in. Here is the light Jordan mentioned in the video. What is your favorite idea from the video? Also can you help Jordan out with any ideas on the pallet? Comment below and let us know! I love you and think you are extremely talented … But, what the hockey sticks is that wooden gizmo for? I’m with Bubba on this one … It’s dangerous and could fall over on the boys … Should be outside as flooring or a wiggle ramp for your treehouse, perhaps? Oh, Jordan, you are so funny! Hahah I’m not telling him he has another vote! For the record, I only propped it up for the video and took it down after. Once I’m done painting it we will physically install it on the wall so it can’t fall over…that is, if I ever get around to painting it! ha! The Take20 code won’t work!!! Try it in all caps! That should work! Beddys discount code isn’t working for me either. Can you let us know if it is still active? Thanks! I can’t remember if this is the post you mentioned it, but can you do a post or video about how you buy your kids clothes a year ahead? There’s not really a trick, just that if I see clothes on sale that are a little big for my kids I buy them anyway and keep them in a bin for when they get big enough! My kids love Beddy’s too! The code is not working for me neither. Any suggestions? Oh shoot I bet it’s expired now! Contact customer service and ask them, maybe they’ll honor it for you! My initial thought for the pallet was to paint a dartboard for practice with nerf, soft darts. I know you mentioned not having toys in their bedroom. Maybe make it into a clothes hamper that they can practice wading up their clothes and ‘shooting’ inside. My other thought is painting a map of a place they like to explore outside, treasure map, etc. Awesome room! Which boy sleeps on the full size bed? The younger or older child? I have my oldest on top and my younger on the bottom. 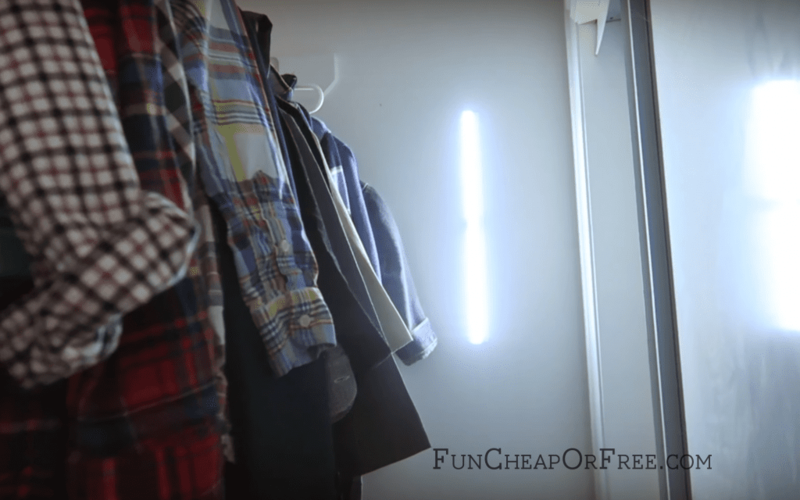 I love the light in the closet, I have really wanted something just like that in my coat closet. Love your style! I have heard so many great things about Beddy’s. So cute! I would love to get a set sometime.